Monthly Specials - Eyewear, Lenses, Appointments & More! Below is a list of our latest specials & deals. Every month we offer amazing discounts and deals to our customers. Make sure to check back frequently so you can take advantage of our latest promotions! 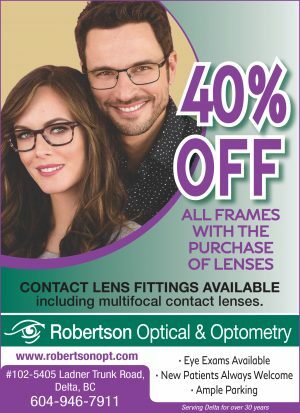 40% OFF ALL FRAMES with the purchase of prescription lenses. See our great selection of frames. 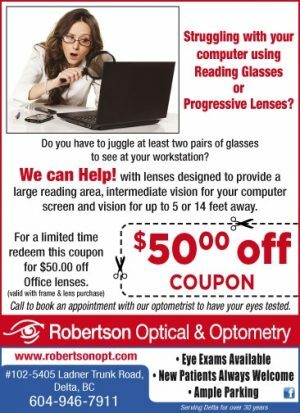 Need an eye exam – call us at 604-946-7911 or use our online form below. Lenses at NO CHARGE with the purchase of FRAMES. Extras Excluded. See store for best selection. Need your eyes tested? Call 604-946-7911 to book an appointment or use our on line booking form. 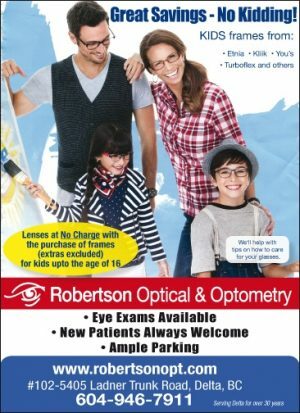 Kid’s Eyewear – Great Savings – Lenses At No Charge with the Purchase of Frames. Hurry in to see our selection. Are You Suffering From Digital Eyestrain? Many people who have a need for reading correction only find it difficult to function in the work situation, where they require the eyes to focus on reading, computer and in the distance. In some cases, they are prescribed progressive lenses, which may not be ideal. This month our focus is on promoting the office lens. This lens gives you the ability to see at reading range, (16-20 inches), and at the computer range (3 feet) and depending on the design of the lens, either up to 5 feet or up to 14 feet in the distance.